As I was running my daily real estate report for available homes at the Apple Valley Lake I noticed that there are 105 active Apple Valley homes for sale as of this morning. What I found interesting is that the average listing price of an available Apple Valley home is $205,613. The reason I found this interesting is because so far in 2010 the average sales price for an Apple Valley home has been only $145,773. The huge value difference can be attributed to the higher than normal number of available Apple Valley lake front homes that are currently listed for sale. Today there are 33 Apple Valley homes that are listed at or above $200,000 with the highest priced active Apple Valley home in the Knox County MLS at $795,000 with only 7 homes selling above $200,000 so far this year. The good news is that there have already been 40 Apple Valley homes sell so far in 2010 and we have yet to reach the peak selling months which are typically July and August. Be sure to watch for our June Apple Valley home sales report. This morning I was researching the number of available homes at the Apple Valley Lake for a client and I determined that there are 99 available homes currently for sale at the lake. There are 14 Homes that are priced under $100,000 with an average listing price of $85,821. For those of you who have heard rumors that you can't find an affordable home in Apple Valley we have another 14 reasons why that just isn't true. To put this into perspective a base 30 year mortgage at 5% interest based on a $85,821 loan amount is only $460.21 per month. There are 28 homes that are priced between $100,000 to $150,000 with an average listing price of $127,253. A sample base monthly house payment for a $127,253 loan at 5% interest for a 30 year term is $683.12. There are 26 homes that are priced from $150,000 to $200,000 with an average listing price of $168,994. A sample base monthly house payment for a $168,994 loan at 5% interest for a 30 year term is $907.20. There are 8 homes that are priced above $200,000 to $250,000 with an average listing price of $227,332. A sample base monthly house payment for a $227,332 loan at 5% interest for a 30 year term is $1,220.37. There are 5 homes that are priced above $250,000 to $300,000 with an average listing price of $287,010. This price range is typically where you could potentially start to find the entry level water front and lake front homes. Currently two of the homes in this price range have water frontage. There are 9 homes available in the Apple Valley that are priced above $300,000 to $400,000 with an average listing price of $356,777. All 9 of those homes feature either water frontage or lake frontage. This particular price range is VERY hot during the summer months. Roughly half the homes that sell in this price range and above are purchased as a vacation home or summer home. There are 9 Apple Valley lakefront homes available at the that are priced above $400,000 with an average listing price of $555,188. The lowest priced home in this price range is $419,000 and currently the highest Apple Valley home is listed for $795,000. If you are interested in receiving an updated list of available Apple Valley homes sent directly by e-mail as new Apple Valley homes come on the market be sure to register for our Apple Valley Automated Listing Search. 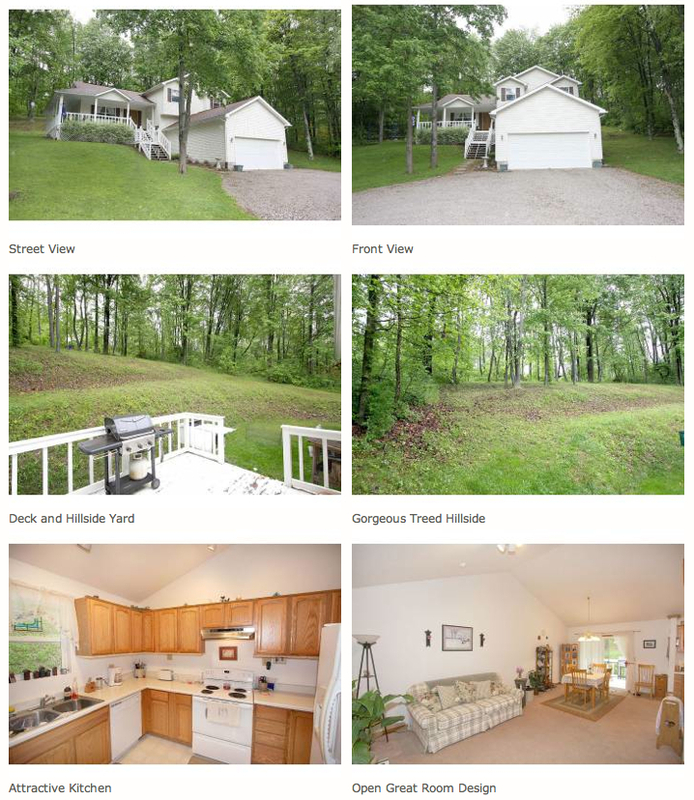 All information listed above was derived from the Knox County MLS on May 25th, 2010 by REALTOR Sam Miller of REMAX Stars Realty (740) 397-7800. Super spacious split level located at 3219 Apple Valley Drive in Highland Hills Subdivision at the Apple Valley Lake, featuring 4 bedrooms and 2 ½ baths, an inviting covered wrap around front porch, inside you will find a vaulted ceiling living room with an adjoining dining area, attractive oak cabinetry filled kitchen that includes all the major appliances, 2nd floor laundry conveniently located near the bedrooms, huge lower level family room highlighted by a fireplace plus there is a 4th bedroom and half bath downstairs, 2 car garage, relaxing rear deck and a hillside yard, natural gas forced air heating and central air, easy care vinyl siding, this home is larger than it looks and it is priced really right at just $137,500. REALTOR Magazine recently wrote an article highlighting our Apple Valley real estate business and the success we have had marketing and selling homes and lots in the Apple Valley Lake community. REALTOR Magazine is the official trade publication for the National Association of Realtors and they print and deliver more than 1,000,000 copies each month. I feel very fortunate to have been the only agent in Ohio that was featured in this article. This article has enhanced our visibility relating to the Apple Valley Community and it has helped generate thousands and thousands of additional visitors to our Apple Valley Website. One of the best benefits of this article has been the business connections we have made with real estate professionals from all over America. When many of these top real estate professionals have a buyer interested in purchasing a home or lot in Apple Valley they now know they can refer their clients to The Sam Miller Real Estate Team. See available homes in the Apple Valley Community Click Here. View available lots in the Apple Valley Community Click Here. Click Here to receive FREE Apple Valley real estate listings sent directly to your e-mail inbox. Is The Housing Market Turning Around? Many of you have been asking how the housing market is doing and are wondering if housing prices are rounding the corner and heading up. Throughout the country housing prices in May showed their first gain in three years. Is this a sign that the market may finally be turning around? Yes! According to an article in USA TODAY, titled Housing Prices Rounding A Corner?, "home prices rose 0.5% in May from April, according to the Standard & Poor's/Case-Shiller home price index, which measures changes in the value of residential real estate in 20 cities." The article also states that a smaller inventory of homes for sale and a continuing rise in homes sales is a promising sign that the market is indeed stabilizing. According to Wall Street economists, home prices in 15 of the 20 cities surveyed, rose or remained stable. There are cities still struggling. Phoenix, AZ, Las Vegas, NV, and San Francisco, CA to name a few! The cities of Dallas, TX and Denver, CO, have reported three months of prices that were higher than the previous year. Cleveland, OH and Boston, MA were up 4.1% and 1.6% (Wall Street Journal, "Home Prices Rise Across U.S.") respectively. Although year on year growth rates are still not good, critics believe the housing market has hit rock bottom and is now on an upswing. Since January 2009, the home price index is now showing four consecutive months of smaller annual declines. This positive data is good news for lenders, who will start to see the values of their assets move higher thus resulting in fewer losses. But according to USA TODAY and the Wall Street Journal, "economists say the big question now is whether the promising signs in the housing market will encourage homeowners enough to result in more consumer spending." (USA TODAY) As reported in the Wall Street Journal, "the improvement in housing likely gave a small boost to U.S. gross domestic produce in the second quarter, economists said. After data showed construction of new homes was stronger than expected in June and was revised higher in April and May, Macroeconomic Advisers, a St. Louis based forecasting group, ratcheted up its estimate of second quarter economic growth. It now sees output shrinking as just a .5% annual rate in the second quarter, compared with declines of 6.3% and 5.5% in the previous two quarters." Although it is still difficult to get a loan, the market is slowing getting better. If you are in the market for a new home, now is a WONDERFUL time to buy. There are various government programs out there now as well as rock bottom rates. Contact us to find your Apple Valley Lake home!! !